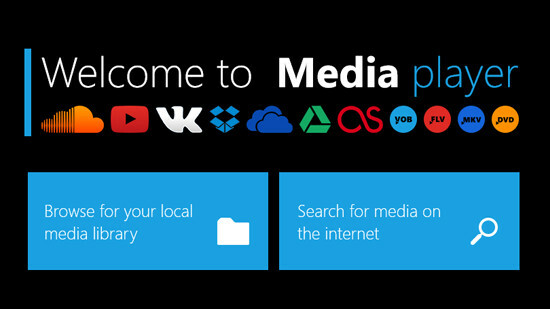 Media Player is a really good audio and video player for Windows 8 and above. It is a great alternative for the old Windows Media Player. Media Player is developed by Digital Cloud Technologies LLC to bring out the best of listening to music and watching videos experience to a better level. The Media Player lets you play songs in shuffle mode and also lets you repeat a particular song or repeat the whole playlist. The Media Player works in background as well, you can continue working on what you want to. Every time the song changes, the Media Player opens a small drawer at top right of the window and tell you the name of the on going song. Media Player reads audio and videos from your local drive, flash drive or from the cloud or online service, so you are never missing out your media files from any of your drives. 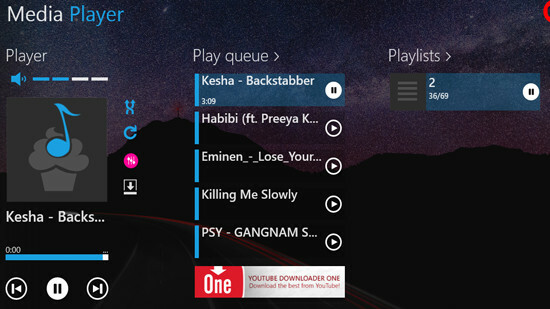 The user-interface of the Media Player is beautifully designed, the main player settings are on the left side of the window, next to it is the Play queue list which tells you the list of songs in the present playlist. Next to it are the Playlists that might have been saved earlier. Beside Playlists you will see an advertisement as Subscription. The Media Player can be customized with its color scheme, there are various options that can help you change the color from magenta, purple, cyan, etc. It also supports various languages so that you do not face any problem in understanding the things on Media Player. The supported languages includes French, Deutsch, Turkish, Italian, Portuguese, Spanish, English and more. Media Player has an option of logging in to your Last.fm account to browse and listen to the songs. With Last.fm account you can listen to music from the online streaming. You can connect OneDrive, GoogleDrive, Dropbox, VK and Last.fm to Media Player to easily access your online and cloud media locally on your desktop. The supported audio and video formats by Media Player are VOB, MKV, FLV, AIFC, MP4, MP3, M4A, WMA, AAC, RM, OGG, DIVX, CAF, 3G, etc. Another great feature of Media Player is that it has an inbuilt timer that lets you set time for stopping the playback of the music. When you set the timer to whichever time you wish it to stop, Media Player calculates the total time of the music played even if you skipped some of the songs in between and then stops the songs from playing at your given time.